Samford University will host noted Korea scholar David C. Kang for a free public lecture Oct. 27 at 7 p.m. in the university’s Brock Recital Hall. Kang is professor of international relations and business, and director of the Korean Studies Institute at the University of Southern California. He is an internationally acclaimed expert on Asia and the author of many books and articles. 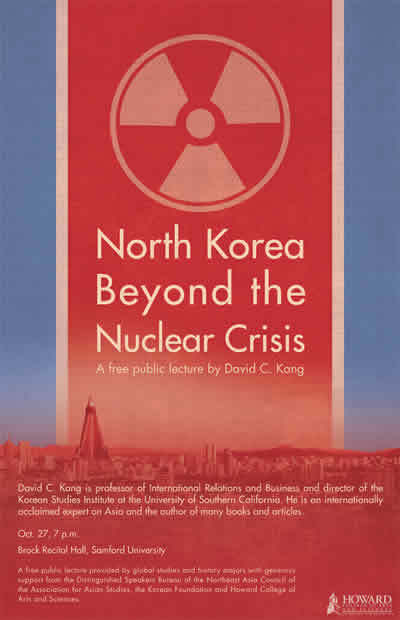 Kang’s lecture–“North Korea Beyond the Nuclear Crisis”–is sponsored by Samford’s global studies program and history majors with generous support from the Distinguished Speakers Bureau of the Northeast Asia Council of the Association for Asian Studies, the Korean Foundation and Howard College of Arts and Sciences. North Korea is often viewed merely as a national security threat or a human rights disaster. Both depictions are accurate but incomplete. At Samford, Kang will address North Korea as a complex whole, and provide a new lens through which to understand its nuclear program, its depressing lack of progress on human rights, its changing economy and how the people of North Korea are changing. Samford history professor Paul Cha, director of the university’s global studies major, invited Kang due to growing student interest in Asia and a general lack of public information about North Korea in particular. Cha, whose scholarship focuses on Korean Christianity in the late 19th and 20th centuries, said a 2013 Liberty in North Korea event on the campus brought an overwhelmingly positive response. “There are not many opportunities to learn anything about North Korea except in the news,” Cha said, noting that many students were surprised by the contrast between the media’s political focus and a broader focus on Korean culture. One attendee was so inspired he wanted to start a local chapter. Cha said the event also inspired many questions about Christian missions in Korea, evidence of a growing local interest in Asia. Each time Cha has offered Samford’s Modern East Asia course, it course has filled quickly. A growing presence of Chinese students at Samford has contributed to interest in, and understanding of, Asia among other students in the core curriculum Cultural Perspective courses he teaches. “Having Chinese students in class has really opened their eyes, in terms of not just Asia, but in terms of different perspectives,” Cha said. Cha said he hopes to serve and promote local interest through the Kang lecture and other events. He hopes, ultimately, to develop an Asia study fund that will encourage interested students to realize that “this is an option. I can do this”.